Isn’t your looppoint too short in the sequencer? @SheffieldBleep ok what about the pad editing screen. I don't see anything weird on this screen. @SheffieldBleep you might need to enable live stretch, and adjust the BPM of the sample until everything lines up. I'll do more fiddling! Thanks! @SheffieldBleep hey, try to adjust the sample bmp to 170. @SheffieldBleep Just doing my part. The old saying, "those who can't, teach" I make way more tutorials than I do actual music so I guess it fits. @SheffieldBleep a 4 beat loop at 120bpm would be exactly 2 seconds in length, So your duration is out.. in fact a duration of 2.971 is 86 beats per min. 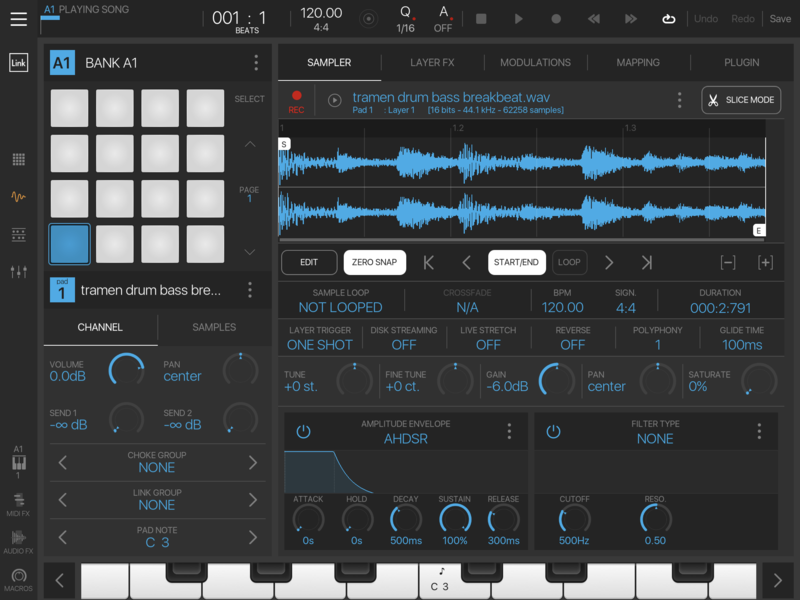 Beatmaker isn’t really intended as a loop player. You can loop samples to get a sustained note but for beat qantised loops you’re going to get dodgy results in an app like BM3. Speaking from experience... better loop apps are GarageBand and LaunchPad. Ok, thanks @LucidMusicInc, but I don’t have beatmaker, I’m just stating why sheffieldbleep is having problems looping a beat at 120 bpm ! . Because the length/duration says the loop is actually 86 bpm..
Beatmaker has multiple ways to sync loops and use them, it works great with loops. It's very good for looping IMO. BM3 boasts many great features but the reality is that most of those features behave anomalously. It’s a buggy app. LOL at all the misinformation here about BM3 not being good at looping. It seems we have a Marmite situation. Those who understand BM3 absolutely love it; those who don't, disparage it. 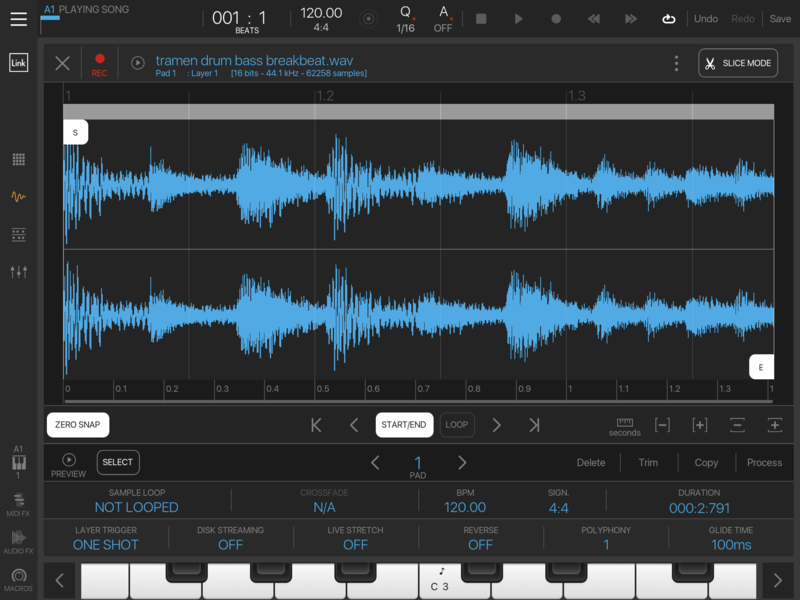 I struggle to think of any looping sampler on iOS (DAW or plugin) that can compare to BM3. You can even build modulating synths by looping single cycles in it! Sure.. there are better dedicated looping tools out there.. but we're not those kind of musicians here, are we? Whatever... op said he tried time stretch to no avail. If it doesn’t work as advertised it’s broken as far as I’m concerned. No offence to anyone (genuinely), but OP was doing it wrong. You can't hijack that mistake in order to slander the app, surely? Sorry guys I’m going to keep it on topic, I’m not debating BM3, I’m basically saying that (looking at the above screenshots) @SheffieldBleep ‘s problem can be solved by adjusting the project tempo to 86 or 172 bpm. It looks to me that BM3 displays the samples total duration.. you can use this to calculate the tempo, if it’s an exact (or near as) 4 or 8 beat loop..
Get a calculator and type in 60 divided by the duration (in this case) 2.791 press equals = 21.497671111 now times it by 4 (if 4 beat loop) = 85.990 .- or 8 for an 8 beat loop. I wasn’t slandering the app or hijacking the thread I was merely stating the fact that for loops, particularly timestretched loops your better off using something different. Sure it has some bugs/quirks but the sampling section has always been highly functional and extremely deep. It's no surprise the people that get on well with the app have a mostly sample based workflow. A few AU plugins are definitely less stable than all the others, unfortunately - if you identify any particular ones causing you crashes and/or issues please report it over on the Intua forum so others there can test and help contact plugin devs with evidence of the issue/s. The number of hard crashes shrinks with every new version of the app, and recent iOS updates have also improved things in that regard. I don't think I've experienced a single hard crash in months now - though it certainly seems to slightly help that I'm using an iPad pro.